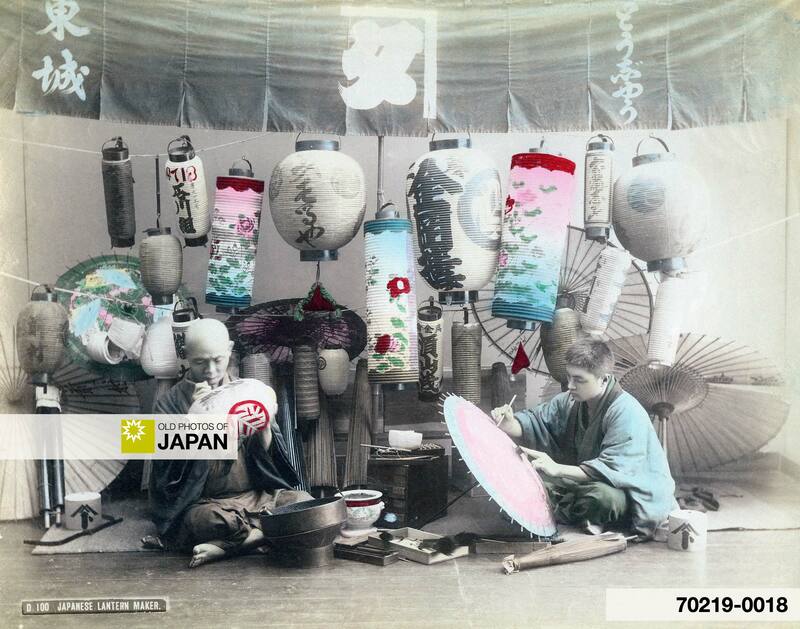 This studio photo reconstructs the work place of a lantern and umbrella craftsman and his assistant. The name of the shop is Tojo (東城). The craftsman is writing on a lantern, while his assistant is coloring a paper umbrella. That Japanese umbrellas were made of paper never ceased to amaze Western visitors. The peculiar qualities of Japanese paper, most of them excellent ones, and the great variety of uses to which it is applied, are known everywhere. It is a wood or bark paper, and derives its properties from the substances of which it is is made and the method of its manufacture. Several plants are cultivated for the manufacture, which, in the absense of English names, must be called by their Japanese or scientific ones, of which the principal are “mitsumata” (Edgeworthia papyrifera), the “sozo” (Brossonia papyrifera), and the “gampiju” (Wiekstroannia canecensis). Bamboo bark also furnishes a good paper, but is not much used. The mitsumata ramifies into three branches, and is cultivated in plantations, being propagated from seeds and by cuttings. It is fit for use in the second year if the soil is good. Its cultivation and exportation have reached an enormous importance, largely because the Imperial Printing Office uses it for bank notes and official documents. The sozo is propagated by seeds, and somewhat resembles the mulberry. The gampiju is a small shrub which is cut in its third year. To make paper, the bark is steeped in a kettle with buckwheat ashes to extract the resin in it. When it is reduced to a pulp, a sieve-bottomed frame with silk or hempen threads is plunged within, very much as in Western paper-making. This, letting out the water, holds the pulp, which, felting, is to form the future sheet of paper. This is pressed, to squeeze all the water out, and is left to dry. The uses made of paper in Japan are innumerable, particularly in old Japan, which treasures up its past. The papers, though all made in a similar way, are called by different names, according to the uses to which they are applied and their origin. Window lights are made of paper, and partitions between rooms, when it is stretched on frames, which work as sliding doors. The celebrated lanterns, called gifu, are made of it at Tokio [sic] and Osaka. Under the name of shibuganni [sic] it is applied to the covering of umbrellas which are sold in China and Korea. As zedogawashi bank notes are printed on it. Oiled it is kappa, impermeable and suitable for covering packages and for making waterproof garments. Handkerchiefs are made from it, cords by twisting. For light, solid articles it is mixed and compressed very much as our papier-maché. Covered with thick paste and pounded, it forms tapestries. Imitations of Cordova leather are made of it by spreading it and pressing it with hard brushes upon boards in which suitable designs have been cut. It is then covered with oil and varnish. 1 “Fragments of Science: Japanese Paper.” Popular Science, Jan 1900, Vol. 56, No. 23, Bonnier Corporation: 389-390. You can also licence this image online: 70219-0018 @ MeijiShowa.com.